Easystay Serviced Apartments Melbourne have 6 great locations in the bayside area of St Kilda. Accommodation at the Easystay Apartments in St kilda gives you the choice of either our Premium Apartments at Abode, Standard Family Apartments, discount budget apartments or the affordable Bayside Motel in the heart of the action. Easystay's cut price approach to apartment and motel accommodation puts more dollars in your pocket so you can enjoy your St Kilda beach holiday more. The Bayside Standard Motel Room at Easystay motel and apartments provides special, budget motel accommodation in the heart of St Kilda, Melbourne. These discount motel rooms sleep 2 guests on a Double bed and contain air-conditioning, colour TV, direct dial telephone, tea and coffee making facilities and a small fridge. Budget motel accommodation in a fantastic St Kilda location, right on the vibrant Fitzroy Street. 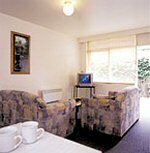 For more quality motel accommodation stay in a Premium Motel Room at the Easystay Mayside Motel in St Kilda, Melboune. 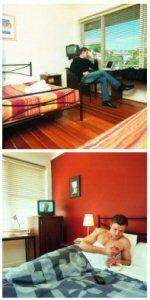 These rooms are situated right in the heart of St Kilda on trendy Fitzroy St and are only minutes walk to the famous St Kilda beach. These motel rooms contain a Queen size bed, refurbished modern decor, air-conditioning, color TV, direct dial phone, data port, large desk, tea and coffee making facilities and a small fridge. 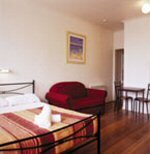 Quality St Kilda motel accommodation at very affordable discount rates. The Carlisle Street Studio and Family Apartments at the Easystay serviced apartments in Melbourne provide travllers to St Kilda with comfortable and affordable budget apartment accommodation in a great St Kilda location. These apartments are only a short walk from cosmopolitan Acland Street and feature a Queen and Single bed, air-conditioning, open plan apartment with kitcehnette, microwave, full size fridge, feezer and 2 hot plates, TV, couch and telephone. The ideal family apartment accommodation in St Kilda. The One Bedroom Apartments at Easystay apartments are located in Raglan Street St Kilda and offer budget apartment accommodation in Melbourne. These apartments include a double bed in the bedroom and a foldout double bed in lounge, fully equipped kitchen, full size fridge, freezer, microwave and oven. 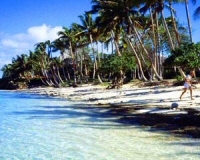 Great apartment accommodation with very affordable discount rates available online. Easystay's Studio Apartments are located on Blessington St in St Kilda and provide travellers to Melbourne with the ideal budget apartment accommodation right in the heart of St Kilda. These apartments contain a double or double and single bed, kitchen with gas oven, fridge/freezer and microwave, colour TV, 2 seater couch and telephone. Economy studio apartment in St Kilda which are ideal for weekly stays. The Abode by Easystay studio apartments offer modern, affordable apartment accommodation in a fantastic St Kilda location. 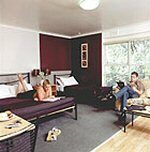 These studio apartments feature double or twin bedding, a kicthenette with microwave, small fridge, cutlery, cookware & twin cooking hobs, granite black ensuite with shower and telephone. Melbourne's famous Acland Street with its cakeshops, restaurants, cafes and shops at your doorstep when you stay at the Abode by Easystay Studio Apartments.